Tuesday, April 18, 2017 Filed Under: Film | Why Did I Watch That? When I watched Death Race 2, I said it would be a better movie if it was worse. This is that movie. Making sequels to bad action movie franchises and replacing almost all of the actors is generally a really bad idea. But doing it twice takes this idiocy to new levels. 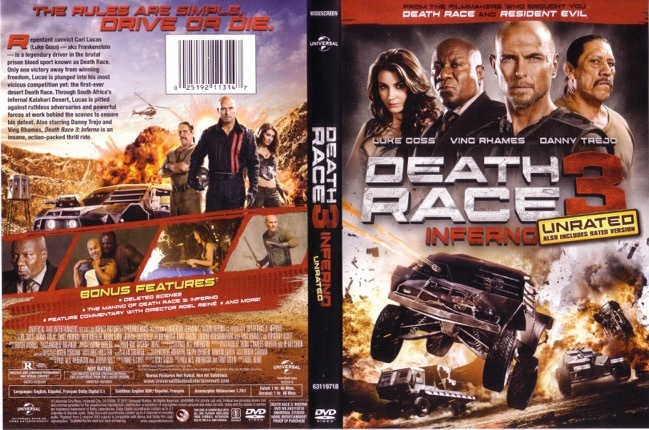 In my continuing adventure to see how bad a franchise can get, I sat down with Death Race 3: Inferno as the action jumps from the bleak and grey Terminal Island to the middle of the desert. Ostensibly it is so the races and “action” can be bigger, and to change the now familiar backdrop into something new and exciting, but instead it feels like a decision propelled more by the budget. One hidden benefit is that it divorces itself somewhat from the first two movies, which populated the same space physically, and as such, felt entirely too similar. Luckily, this movie requires so much less setup than the last one did. We don’t need to introduce our hero or the concept of the Death Race. We already know these things (as dedicated fans of the franchise should), so we just have to hand wave away his horrific injuries from the end of the second movie, and have a bunch of cars fighting in the desert. There will be explosions, promiscuous women, racial stereotypes, and a lot more fire to fit in with the whole “inferno” theme. Your favorite part of the last movie returns as well. Intrigue and confusing plotting like a low grade thriller. There are probably half a dozen different stupid, convoluted plans running throughout this movie that by all rights should never actually work. But of course they go off without a hitch, because they somehow have to tie this movie into Death Race. Being the sequel to the prequel of a gritty reboot is a lot of work for one terrible group of filmmakers. By removing the fluff, they did make a better movie. It is still god awful, worse in many ways even. But it isn’t bogged down with inconsequential world building and asinine plot threads, leaving more time for romance that I don’t care much about and bad explosions. The ending is contrived, but it is a decent bit of revenge, even though it makes no sense how Death Race would come after it. I don’t know why I expected anything differently.